Streamlined 2' x 4' planter box fits anywhere, so you can create a convenient kitchen garden or a stunning flower display. Waist-high for easy planting, tending and harvesting, it's big enough for tomatoes and deep enough for carrots. Like our other made-in-Vermont cedar planters, the sides are held in place with our lifetime aluminum corners. In the vertical position, the 4' Space-Maker Pivoting Trellis supports large plants like tomatoes. 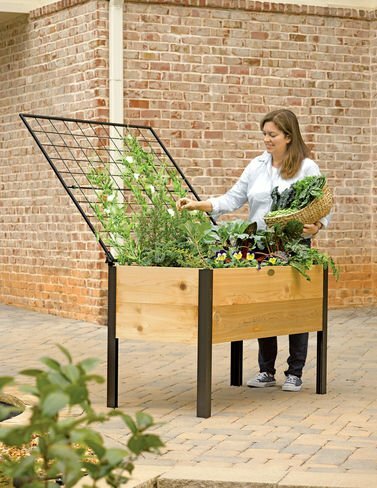 Pivot it out at any angle up to 45 degrees to support peas and cucumbers, extending your growing space without increasing the planter's footprint. Also ideal for pole beans, small-fruited squash and flowering vines. The pivoting connectors fit securely into the corners of the planter box to create a fully integrated support system. Trellis holds up to 10 lbs. at 45 degrees?